We set up our table and display in front of the Joel D. Valdez Library in the early morning hours and spent the day presenting the line up of TEVA Tucson member cars to the public. The movie "Evolve: Driving A Clean Future In Coal Country" was shown in the lower level meeting room of the library on a continuous loop. We had many interesting discussions with people about EV's and discussed general ideas about improving the nations energy policies. 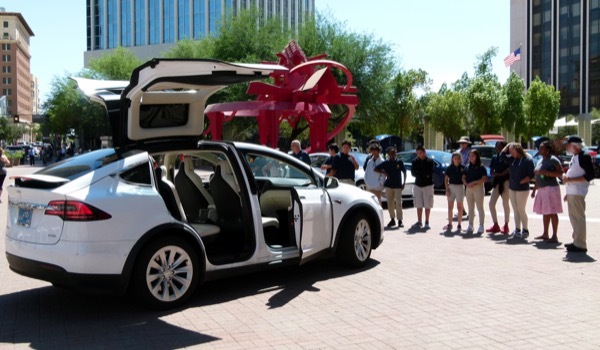 Ron Koehler displays his beautiful while 2017 Model X Tesla for a group of students. An all day continous screening of “EVOLVE: Driving a Clean Future in Coal Country” in the lower level of the Joel D. Valdez Library with an EV vehicle display in Jacome Plaza in front of the library. Registered attendees report 138,448 electric miles driven.